Wunderlist is a to-do list and task tool that helps you organize your life along with professional collaborative work as it can be shared with your family, friends, and colleagues. Through this, you can organize your projects anywhere. 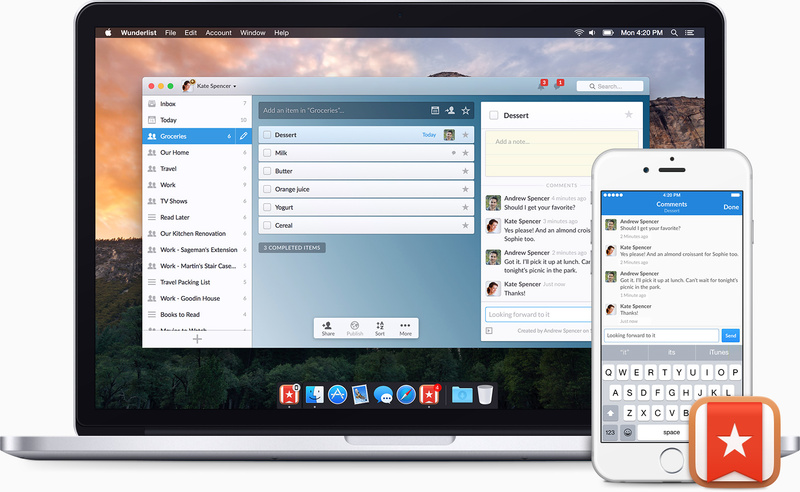 "Wunderlist is that personal assistant that everyone wishes they could find. This app will help you organize your life, errands, friends and conversations in one place. It will even help you with your grocery list so you don't forget bread again. You can have conversations with friends to keep up with your activities with them and keep up with your work schedule also." "I used to forget meetings a lot.Am a people person and I attend a lot of meetings and when y friend introduced me to Wunderlist,am able to set reminders and tat way I never miss meetings.I plan my work everyday and this app has helped me a great deal because I never forget my to do list." "This website was not in English so I could not effectively review what it had to offer. It looks like maybe some sort of social networking platform but I could be wrong." 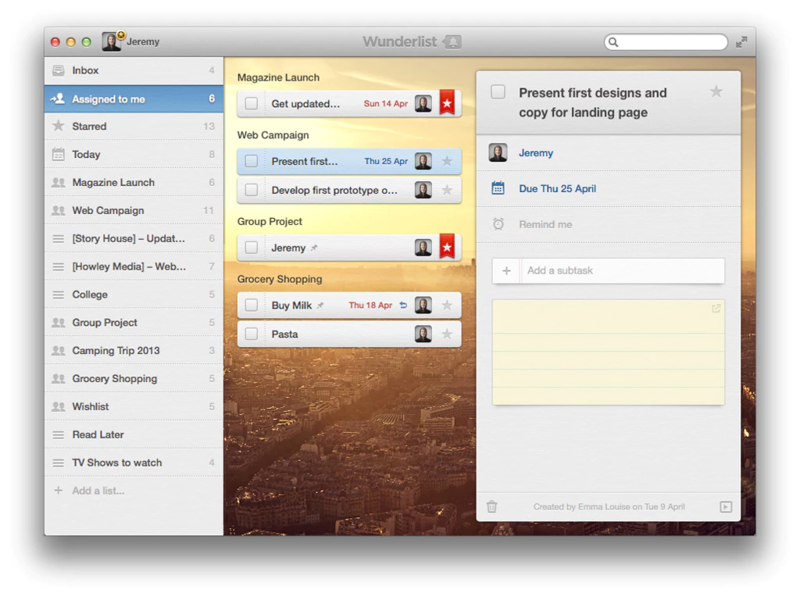 "If you need to manage your tasks, Wunderlist is perfect for you. It's easy to use." "Task list organizer--can always use a new a improved organizer." "Thanks to this app i no longer have to leave notes on the ref to remind my husband of the things he must do. Because through here i can basically just send him a notification on what tasks and reminders to tell him to do. Definitely a life saving app! " "Not bad for a task tracker tool. I can add a presentation and attach photos. 👍"
"I have a hard time keeping things organized when it comes to my to do list for the week. 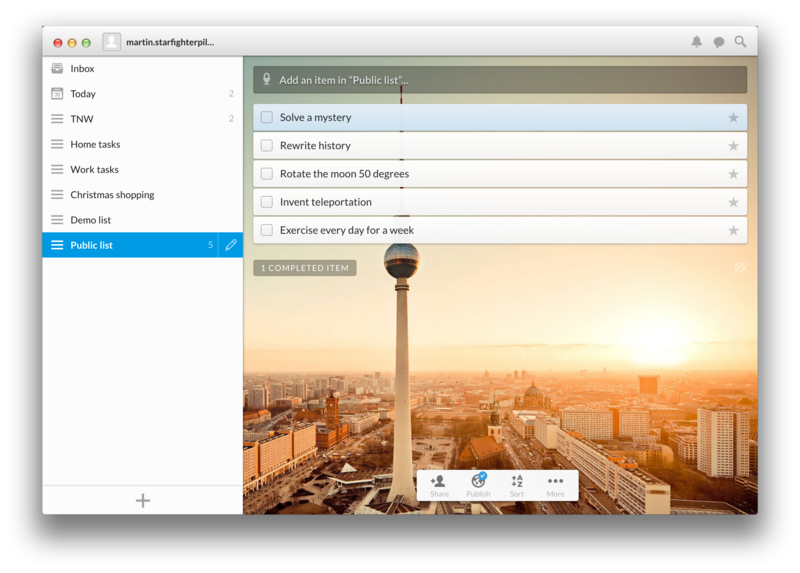 Wunderlist takes a lot of the guesswork out of finding the time to do things, as well as keeping things easily organized and manageable. " "Use this all the time to keep my to do lists organized. It's really great! My favorite feature is that it lets you set reminders/alarms for specific tasks. " "This was great. It basically combined reminders, calendar and my to-do list into one app. This is very convenient. " "Nothing has ever been able to keep me organized. But now I have Wunderlist and I can set reminders for literally anything which makes my to-do-lists vanish faster than ever." "This is a fantastic recommendation for the given problem." "Pretty good schedule/organizer. I like this one a lot more though, I used more than a few organizers on my computer but it wasn't really compelling for me to stay on top of it. However, since I've got my phone on me all the time, Wunderlist is way more interesting. Anyway, I think this is just the best polished organizer app on mobile devices. That's all an organizer can optimize on, anyway, polish; and this app has it in spades." "This is the best app for helping with organizing your day. I had a really busy day yesterday. I had 2 doctor appointments, a dinner date, and a late meeting. I was able to easily put all of this information into this app, and I was on time for them all. The reminders are great! I also love being able to put notes for myself. I forget things easily, and it's like this app was completely made for me!" "A good way to get organised across devices. All your list at your fingertips no matter where you are." "I use Wunderlist to maintain my calendar and really like it. I like that I can set reminders and also use comments right with the event to discuss it with all involved, make changes and save it right there. Nothing to remember to do later. " "I love using Wunderlist since it's a great application for those that need a better checklist when organizing day to day activities. The interface is very easy to navigate and I can share the list with my friends and family." "I make lists for literally everything, so this is a great app for me. It's so easy to share grocery lists with my significant other. I recommend this app to all my friends. It's really been a great help for me." "When I wanted to move away from the Google suite of apps I looked through a bunch of schedulers/to do apps and none were better than Wunderlist. The interface is super intuitive and it has all the features you'd expect and more. I really like all the different notification settings there are." "Wunderlist is a professionally designed program/site that allows you to create lists and coordinate your work with other people. It would require others adopting use and it's not just for scheduling events, but it looks promising." "For Windows 10 only???? NO, thankyou very much. I'm looking for an alternative to Google Calendar because of their aggressive 'push' policy - so going back to W10 is an obvious NO-NO!!!" "I love Wonderlist. It's clean, organized and has very useful extra functions like sharing you lists with your family, friends and colleagues. " "Wunderlist is a school helping app that you should get if you are a student like me. With this you can sort out your to-do lists. For me I have a folder for each of my classes and then folders for places i must visit, books to read, movies to watch and even my bucket list :)) "